After threatening Susan multiple times on multiple days, she has finally provided me with pictures from her big brother Robert Esparza’s weekend wedding. Way to make us all wait, Susan. But enough about Susan, this post is strictly focused on humiliating congratulating Bruce Clay’s Director of Search Engine Operations Robert Esparza and his gorgeous bride Jacqie on their recent marriage. Here are a few photos for you all to enjoy. Make sure you comment below and wish Robert and Jacqie lots of love, luck and SEO babies! Yey for babies! 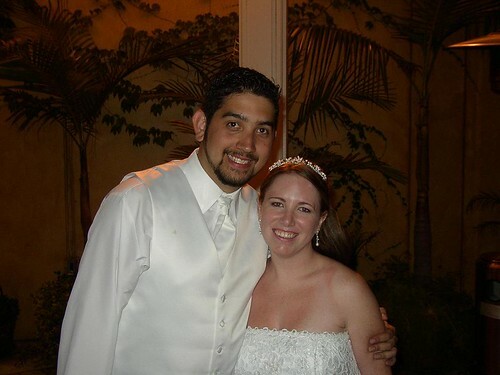 Introducing Mr. & Mrs. Robert Esparza. Robert and Jacqie declare their undying love for another and you can almost hear the cooing of unborn babies. Nothing spells wedding like yummy wedding cake. At least I assume it was yummy. Susan didn’t save me a piece. Obligatory cake on the face photos. The happy couple takes a breather. If they were any cuter Jacqie would give birth to a litter of puppies. Senior SEO Analyst Fernando Chavez and IT Manager Aaron Landerkin were on hand to show Robert and Jacqie their support. Aren’t our boys cute? As a wedding present, Bruce presented Robert and Jacqie with an all-expense paid honeymoon to the Atlantis Resort in the Bahamas. Now that I know getting married earns me a free trip to the Bahamas, I have begun interviewing suitors. Applications and resumes can be sent to — uh, never mind. We’re busting our buttons over our No1 Grandson! Thank you, for the neat pictures. Susan, we love you, too!! !